Why you Need Crystals in your Life Part 1: Crystals are for Skeptics too! So you're a skeptic of Crystal Energy.... Let me ask you this: Do you believe in Yourself? You should! And based on that I've got some great news for you. Part of the power of crystal jewelry is in the Intention we set into the crystals and the purpose with which we wear them. The Soul Mate Necklace combines Amethyst, Rose Quartz and Garnet for all their heart healing and romance promoting powers! When I first began working with crystals I was attracted by their natural beauty, their connection to the ancient past, and the idea of natural healing methods using their powers. I won't pretend that I really believed in that power, but the idea intrigued me. In much the same way, I loved the idea of the language of flowers. Roses for Love, Sweet William for Constancy, Lilies for Confidence, etc. In other words, the language of Crystals was enough to pull me in. Rose Quartz is obviously the crystal of Love. Clear quartz makes sense as the crystal of clarity. Purple is the traditional "artist's color," making Amethyst a gorgeous crystal for painters, musicians, writers, etc. My relationship with crystals could have ended in this layer, and I would still enjoy being a crystal jewelry designer. These stones are so gorgeous that they don't require me to speak on their behalf. But that's not where my relationship with crystals ended. I'll make this story short. I began wearing aquamarine as a symbol of my fight against hypothyroidism and my need for patience as a retail sales manager in NYC. Shortly after that I wrapped a Rose Quartz I'd had since childhood. I decided that the best way to reduce stress was to start each day with the Intention of spreading Love to everyone I met. BOTH OF THESE TACTICS WORKED! 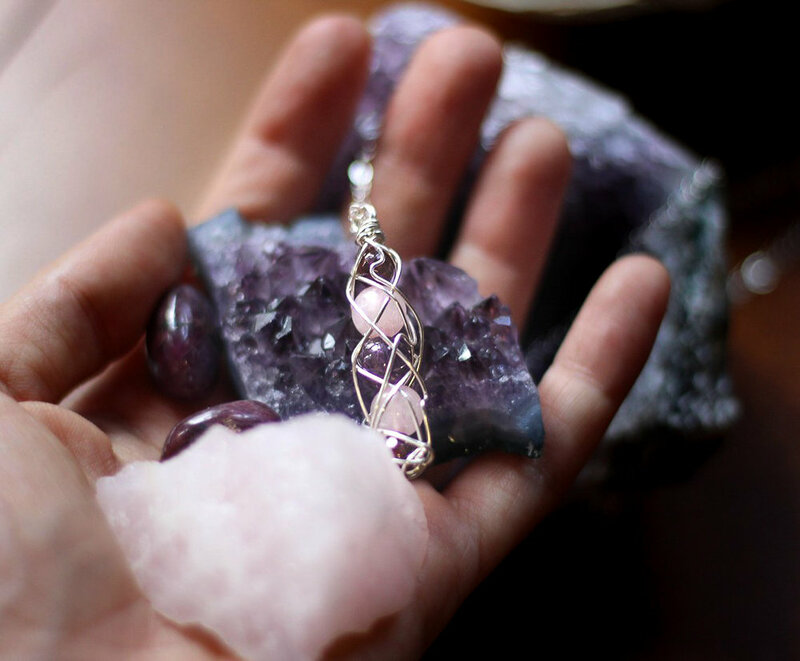 Amethysts are one of my favorite stones for Creative Focus, and their headache curing powers are an incredible BONUS! I began to see my stress reduced and my interaction with customers, strangers, and friends improved to the point where everyone seemed to smile when they saw my happy face. I began to wonder if this was all my doing or if the crystals really held a power beyond scientific comprehension. Then one day I had a massive headache. I took a Howlite and Amethyst from a new Reiki-infused set of Chakra stones I'd found on Etsy. I put these crown and third eye chakra stones on my forehead, laid down on the couch and took a short nap. When I woke up my headache was gone. There was just a slight fuzzy feeling as if the pain sensation had been distributed throughout my head to become a physical awareness rather than a pinpointed pain. That one time may not prove much, but to this day, each time I get a headache I rest that howlite and amethyst against my forehead. As I lay there, I feel a pulsating increase in the pain, followed shortly by a lessening and smoothing sensation. I'll get into more of the healing properties of crystals in Part 2 of Why You Need Crystals in Your Life. But I want you to know that you don't have to believe in crystal healing to get started. Buy just one gorgeous piece that speaks to you and see what change it brings to your life. Part of the power is in your Intention. The crystal acts as a constant reminder of this Intention, helping you to see it through. Beyond this, I firmly believe you will also discover the subtle, yet powerful ways that a Reiki-infused crystal works on its own to improve your physical, mental, and emotional state of being. Try it for yourself and let me know what you discover!